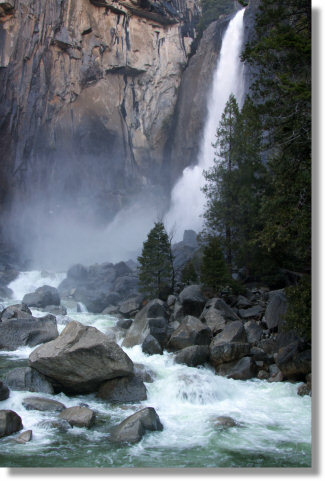 Why See Yosemite Falls? It's a waterfall so high it has to take a break and rest twice in the course of its descent. It's a 2,425 foot tumbler, tallest in North America and fifth tallest in the solar system. Ten times taller than Niagara or Shoshone Falls, nearly twice as tall as the Empire State Building, it's about the height a 200-story building would be, if somebody ever built one. The lower fall, which you'll be seeing up close on this hike, is the shortest section of the fall, but it's still 320 feet (98 meters) high. Scenery Factor: This hike is a scenery sandwich, with dramatic views of the falls at the beginning and the end. In between, though, you'll have to labor a quarter mile through the woods without any overtly spectacular motivation. Try spending the time composing a poem about your favorite travel-related website. You could easily occupy the entire trip just trying to think of three rhymes for "Yosemite". Best Time to Visit: In the spring, when water is roaring off the falls and the breeze it creates at the bridge underneath the falls will blow your hat off. Worst Time to Visit: In the early fall and late summer, by which time the falls have often dried up altogether. Visit the Yosemite Falls webcam during California daylight hours to see how much water is currently flowing over the falls. 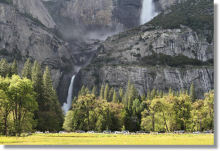 (If this link isn't working, visit the main webcams page and then click on the Yosemite Falls thumbnail. Or just try the streaming version of the webcam.) The webcams only show the upper falls, but savvy outdoorsmen can infer that if the upper falls are dry, the lower falls will be as well. Crowd Factor: You won't be spending any quiet moments alone with nature here. Besides being a spectacular sight, Yosemite Falls seems to emit a sort of mating call, undetectable to human ears, that draws buses from thousands of miles in every direction. Difficulty: Easy. You haven't worked so little for a view this singular since the moon landing was on TV. Parking: Try parking around Yosemite Village, along Northside Drive, or really anywhere you can, with the large lots at Yosemite Village and Curry Village being your most likely bets. Walking through Yosemite Valley is hardly a burden. Nearest Restrooms: At the trailhead. Nearest Snacks: Yosemite Village, half a mile away. Getting There: From Yosemite Village, walk half a mile west to the trailhead. The falls are visible from much of the valley, so finding them should not be a problem. The free shuttle buses, which cover most of the eastern half of the valley, stop at the trailhead. Wheelchair Access: The entire loop is paved. The park service rates the spectacular westernmost approach as too steep for wheelchairs, but the eastern approach has official NPS approval. If this is a relevant topic for you, check out the park service's accessibility guide, which lists, among other things, all the park's wheelchair-accessible trails. On clear spring nights when the moon is full, photographers gather by the score at the lower falls to see the moonlit rainbows that span the water, a phenomenon known as a moonbow, the world's most romantic portmanteau. Yosemite Nature Notes Episode 15 explores moonbow fever and includes lots of lovely footage of moonbows shimmering in front of waterfalls and starry skies. Even the most kitten-kicking of cynics should watch the first two minutes to see a few examples. Can't-Get-Enough-Yosemite-Nature-Notes Dept: You can find the entire YNN series here, though the first thing you should watch after this video is the Making-of-the-Moonbows-Episode episode. Ranger Bob Roney, interviewed in the film, has his own Twitter feed, as does YNN creator Steven Bumgardner. Yosemite Nature Notes itself also has a feed.